James Roger McGuinn was born in 1942 in Chicago, Illinois. James went to The Latin School of Chicago and became interested in music after hearing Elvis Presley's "Heartbreak Hotel". He was also influenced by country artists and other early rockers like groups such as Johnny Cash, The Everly Brothers, Carl Perkins, and Gene Vincent. He soon asked his parents to buy him a guitar. James became a student at Chicago's Old Town School of Folk Music in 1957, and learned the five-string banjo as well as continuing to improve his guitar skills. After graduation, to earn some money playing solo in many coffeehouses. His skills were soon recognised and he was hired as a sideman by a series of folk acts like the Limeliters, and the Chad Mitchell Trio. In 1962, Bobby Darin wanted to include folk within his act and asked McGuinn to play backup guitar and sing harmony. Illness eventually forced Bobby Darin to retire from singing so he opened T.M. Music in the Brill Building, and hired McGuinn as a song writer. He also became a popular studio musician, recording with Judy Collins and Simon & Garfunkel. Jim decided to quit NY and move to LA, California. He had become a fan of the Beatles and wanted to try to incorporate their music into his act. He was hired by Doug Weston at The Troubadour and gave rock style treatments to traditional folk tunes. Gene Clark (1944 - 1991) was also a Beatles fan and liked the sound and they paired up as a duo singing Beatlesque renditions of traditional folk songs, and some self-penned material. David Crosby introduced himself and would harmonise with them on some of their songs. The musicians soon formed a trio and named themselves the Jet Set, a moniker inspired by McGuinn's love of aeronautics. At the time David Crosby was working on his demos at World Pacific Studios and introduced McGuinn and Clark to Jim Dickson. Dickson quickly took saw the potential and took on management duties for the group, He actively encouraged Jet Set to develop their blend of Beatles pop and Bob Dylan-style folk. In 1964, Michael Clarke (drums) joined the line-up. To capitolize on the British Invasion the band's name was changed to the Beefeaters and "Please Let Me Love You" was released on Elektra Record, but it failed to chart. When, Jim Dickson managed to acquire an acetate disc of the then-unreleased Bob Dylan song "Mr. Tambourine Man", he was convinced Jet Set could make an effective cover. They began rehearsing it with a rock band arrangement. Dickson sensed McGuinn and co., were less than convinced and invited Dylan to listen to the band perform "Mr. Tambourine Man". The composer was well impressed at the dance version of his song. Dickson decided to get the band similar instruments to the Beatles and McGuinn played Rickenbacker twelve-string guitar ; Gene Clarke was given a Gretsch Tennessean guitar, which was soon commandeered by David Crosby and Michael Clarke had his own, Ringo style, Ludwig drum kit. Chris Hillman joined the line-up as their bassist. The group signed with Columbia Records and renamed themselves, The Byrds. They recorded "Mr. Tambourine Man" at Columbia in 1965, but Jim McGuinn was the only Byrd to play on it. Producer, Terry Melcher insisted on the Wrecking Crew to lay the backing tracks for McGuinn, Crosby and Clark to sing over. "Mr. Tambourine Man" was released in early 1965 and became number 1 on both the U.S. Billboard Hot 100 chart and the UK Singles Chart. The Mr. Tambourine Man album followed and peaked at number 6 on the Billboard Top LPs chart and number 7 on the UK Albums Chart. The Mr. Tambourine Man album was influential in popularizing folk rock and served to establish the band as an internationally successful rock act, representing the first effective American challenge to the dominance of the Beatles and the British Invasion. The term "folk rock" was coined by the American music press to describe the band's new sound and musical subgenre. The distinctive melodic, "jingle-jangle" twelve-string Rickenbacker guitar played by McGuinn, created ringing arpeggios based on banjo finger picking styles he had previously learned while at the Old Town School of Folk. The musician combined a flat pick with metal finger picks on my middle and ring fingers, which allowed him to combine fast single-note runs with banjo rolls. In the studio, the guitar sound was compressed which resulted in a unique sound which proved immediately influential and popped up in countless other recordings from this time onwards. The close singing of McGuinn and Clarke’s combined with David Crosby’s high harmonies gave a distinct sound. The group meantime had built up a dedicated following among L.A.'s emerging hippie counter-culture as well as Hollywood swinging elite. The Byrds live performances at Ciro's made them a must-see fixture on L.A.'s nightclub scene. "All I Really Want to Do", their second single was another interpretation of a Bob Dylan song. The single was rush-released by Columbia in an attempt to bury a rival cover version that Cher had released simultaneously on Imperial Records. Cher’s version rose higher in the US whereas the Byrds marginally outsold her in the UK. In the UK, the distinctive 12-string guitar sound was very much associated with the Searchers. The Byrds lifted the riff from "Needles And Pins" (1964) and transformed it into the main riff of "I’ll Feel A Whole Lot Better." (1965). What do they say about copying, as the highest of flattery? Originally the song was included on their debut album, Mr. Tambourine Man before it was released as the B-side to "All I Really Want to Do." The song has become one of the most popular Byrd songs on the 60s. On stage the group sported mop-top haircuts, and Jim McGuinn wore granny style glasses, Crosby by contrast, dressed in a striking green suede cape. The group had an air of detachment which was bohemian and a counter point to the Beatle Jackets and uniform presentation of the English Invasion. A stylistic trait of the Byrds' music was also the absence of a lead singer. Behind the scenes members of the band took large amounts of marijuana which often resulted in moody and erratic live performances. In 1965, they toured England to a mixed response. Concert performances, combined poor sound, group illness, ragged musicianship, and the band's notoriously lack-lustre stage presence, ended with alienation of British audiences. The Byrds however, made close friends with the Beatles. Back in the US, Columbia want to release a cover version of Dylan's "It's All Over Now, Baby Blue," but instead decided on a cover of Pete Seeger’s "Turn! Turn! Turn!” It became the band's second U.S. number 1 single, as well as the title track for their second album. The song's lyrical message of peace and tolerance struck a nerve with the American record buying public as the Vietnam War continued to escalate. The subsequent album featured more of the band's own compositions than its predecessor, with Gene Clark coming to the fore as a songwriter. Tension around the band was high suffice Jim Dickson and the Byrds asked Columbia Records to replace Terry Melcher (producer). They did and assigned Allen Stanton, to the band. This was not popular with Dickson who had seen himself move into the role. "Set You Free This Time", was released as a single in January 1966, but failed to break into the Top Fifty. The lyrics of "Eight Miles High" purport to the bands’ flight to London and the their subsequent English concert tour, the song was originally recorded on their return at RCA Studios in Hollywood, in 1965. 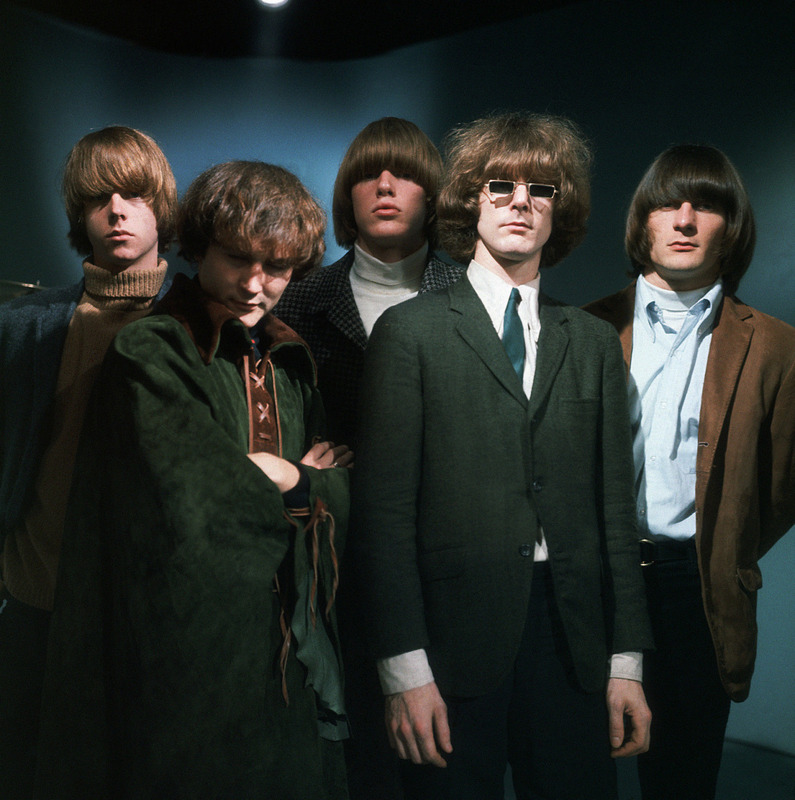 The Byrds were following, some say vanguards of, the new genre of psychedelic rock. At first, Columbia Records refused to release it because it had been made at another record company's studios.. The group re-record "Eight Miles High" at Columbia Studios in Los Angeles in 1966, before it appeared on their third album (Fifth Dimension). Both A and B sides of the single, "Why" drew directly on Indian ragas and “Eight miles high,” was very much influenced by Ravi Shankar in the droning quality of vocal melody. McGuinn’s guitar playing emulates the citar and is played in a free form jazz style similar to the manner of John Coltrane’s saxophone on his Impressions album (1963). The unconventional single was banned by many U.S. radio stations, following allegations the lyrics advocated the use of recreational drugs. Lack of air time meant the single failed to reach the top ten. Just prior to the release of the single, Gene Clark left the band due to his dislike of traveling and chronic fear of flying. There was also mounting resentment by other band members about the extra income he got from his songwriting. Fifth Dimension, was a platform for the band’s new psychedelic sound but met with mixed critical reception. It was less commercially successful than its predecessors, peaking at number 24 in the U.S. and number 27 in the UK. Chris Hillman took over as the band’s third vocalist. "5D (Fifth Dimension)", was released as a single but suffered the same fate as "Eight Miles High", and was banned by a number of U.S. radio stations for supposedly featuring lyrics that advocated drug use. Younger Than Yesterday (1967) , was their fourth album and was produced by Gary Usher. The group had more or less returned to their routes but were also beginning to explore country rock. No longer a band with teen pop appeal, they were experimenting with brass instruments, reverse tape effects and an electronic oscillator. The album appealed to the older LP buying set and reached No. 24 on the Billboard Top LPs chart and reached number 37 on the UK Albums Chart. The single, "So You Want to Be a Rock 'n' Roll Star", was a satirical jibe at the manufactured groups like The Monkees and was released before the album. It barely scratched the Top Twenty in the US. Two further singles, "My Back Pages" and "Have You Seen Her Face", only had moderately success. The Byrds had peaked. Despite the lack of interest in both album and singles at that time. Younger than Yesterday is now considered by many to contain some of their best work. By mid-1967, Jim McGuinn had changed his first name to Roger. He followed the Indonesian religion Subud, and it was common among the faithful to adopt a new name to signify a spiritual rebirth. The group split with their managers, Jim Dickson and Eddie Tickner, and Larry Spector took over their business affairs. Back in the studio, they recorded "Lady Friend", penned by David Crosby, which was released as a single in July, 1967. David Crosby had closely overseen the making of the record and when it failed to break into the Top 50 Billboard Chart he was bitterly disappointed and blamed producer, Gary Usher. Columbia decided to follow Bob Dylan’s success and release The Byrds' Greatest Hits, as a compilation album. It proved a critical and commercial triumph, peaking at number 6 on the Billboard Top LPs chart. The Notorious Byrd Brothers (1967) was the band’s fifth album but during recording Roger McGuinn and Chris Hillman became increasingly irritated with David Crosby's overbearing egotism. Michael Clarke quit over ongoing disputes and was temporarily replaced with session drummers Jim Gordon and Hal Blaine. Clarke continued meantime to honour his live concert commitments with the group. When David Crosby refused to take part in the recording of the Goffin–King song, "Goin' Back", claiming it inferior to his own composition, "Triad", he was sacked. Gene Clark made a brief return and sang backing vocals on the songs "Goin' Back" and "Space Odyssey". When the album was released it was well enough accepted by the critics but only met moderate commercial success. The single "Goin' Back", but only scraped into the top 100 Billboard chart. Roger and Chris elected to continue as the Byrds and hired Kevin Kelley (drums) to complete a college tour in 1968 to promote The Notorious Byrd Brothers. The trio found it impossible to recreate the band's studio recordings and hired Gram Parsons as a keyboard player and guitarist. Parsons quickly asserted himself and introduced more country rock which appealed to Chris Hillman but Roger McGuinn remained ambivalent. The next album, Sweetheart of the Rodeo, was recorded partly in Nashville and finished in LA. Gram Parsons continued to exert a dominating influence over the band much to the irritation of the others. Contractual problems arose post-production when it was alleged Parsons was still under contract to his LHI record label, so to avoid litigation Parsons' lead vocals were replaced by McGinn and Hillman on "You Don't Miss Your Water", "The Christian Life", and "One Hundred Years from Now," but credit was still given to him on the album cover. On completion of the album, the Byrds appeared at a charity concert at the Royal Albert Hall, London, then on their return to California, the album was released. Although it was not the first country rock album, (that honour fell to Parsons with Safe at Home), the Byrds were the first an internationally successful rock act to break the genre. The Dylan song, "You Ain't Goin' Nowhere" was chosen to be the single and both met with cautionary acclaim but saw the Byrds back in the charts again. The Byrds announced, they would tour South Africa and at the time of Apartheid, this was very controversial. Parsons decided to stay in England and not participate on the grounds he did not want to perform in a racially segregated country. His sincerity was question by Hillman, believing the singer wanted to stay in England with Mick Jagger and Keith Richards, whom he had recently befriended. Gram left the band and pursued a solo career before he died in 1973, following an accidental overdose of morphine and alcohol. On their return from South Africa, McGuinn and Hillman decided to carry on and recruited Clarence White (guitar) as a full-time member of the band. White became dissatisfied with drummer Kevin Kelley and convinced McGuinn and Hillman to replace him with country rock drummer, Gene Parsons. Since the South African debacle, Chris Hillman was disenchanted and was frustrated with business manager, Larry Spector's mishandling of the group's finances. Back stage at the Rose Bowl stadium in Pasadena, Hillman and Spector came to blows after which Chris Hillman left the group to join Gram Parsons in forming the Flying Burrito Brothers. Roger elected to continue with a new line-up. The Byrds next single "Lay Lady Lay" (1969), failed to reverse the group's commercial fortunes in the U.S. For their next album, the Ballad of Easy Rider, the band parted company with producer Bob Johnston and re-enlisted Terry Melcher. The first single was the title track which had been written for the movie Easyrider. It reached Number 65 on the Billboard Hot 100 chart, but their version did not appear in the film, instead an acoustic version credited to McGuinn alone, was used. When the Ballad of Easy Rider album was released in, it peaked at number 36 in the U.S. and number 41 in the UK, becoming the band's highest charting album for two years in America. "Jesus Is Just Alright", was released as a second single but it only managed to reach number 97. When John York was asked to leave the band and replaced by Skip Battin. The Byrds released a double (Untitled) album in 1970 and it peaked at number 40 on the Billboard Top LPs chart ( umber 11 in the UK). The double album had one LP of concert recordings and another LP of mainly new studio material. The single "Chestnut Mare" was heavily promoted on FM Radio in the US but sales were poor. However, it did much better in the UK and crept into the Top Twenty Singles Chart. The Byrds completed a sell-out tour of England and Europe in 1971, and their performance at the Royal Albert Hall in London was later released in 2008. Byrdmaniax was the follow up album to (Untitled). The group had been busy touring and left the final production to Terry Melcher, but when they heard the album they wanted it remixed and the orchestration removed but Columbia Records refused. The album was poorly received by critics and fans alike, yet it performed reasonably well in the U.S. charts, peaking at number 46 but failed to make the UK charts. Melcher resigned as the Byrds producer and manager soon after. CBS Records issued The Byrds' Greatest Hits Volume II in 1971 but it failed to chart. A year later The Best of The Byrds: Greatest Hits, Volume II had a similar reaction on the US. The Byrds had material recorded at CBS Studios in London and hastely released Farther Along in 1971. It scarcely charted in the US, and not at all in the UK. The group carried on with live gigs but Gene Parsons was sacked in 1972 and replaced initially by John Guerin as a sessions drummer. Other drummers would follow and in 1973, Skip Battin was dismissed by McGuinn. Chris Hillman, was encouraged to return for a tour which eventually was cancelled. The Byrds' final album (Byrds), was released in March 1973, with the reunited group disbanding soon afterwards. The album climbed to number 20 on the Billboard Top LPs & Tapes chart and number 31 in the UK. The single, "Full Circle", ironically failed to chart.